Any property would be more valuable with water features. Having one added to your outdoor space will not only make it more aesthetically special, it will also provide a great focal point and a beautiful source of relaxation. We provide installation of water features for both residential and commercial spaces within Georgia. We make sure that they match your needs and your preferences. If you already have an existing water feature that does not seem to provide you with the benefits you so long to have, we can help enhance it for you or replace it with a whole new type of water feature. Ponds - The great thing about pond is that they blend perfectly with most other elements in a natural setting of a landscape. 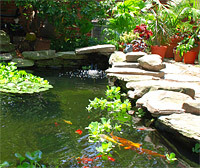 You may also add aquatic animals, like fishes, to make them even more pleasant and enjoyable. Bird Baths - Not only are these visually appealing, the sound of flowing water and birds chirping could help the mind and body relax. With a working pump, these barely require any sort of maintenance. Fountains - These are, probably, among the most elegant and sophisticated types of water features. They are built for the eyes to feast on. These can be added to existing swimming pools or to stand alone as landscapes' focal points. Water features are not only for residential properties. In fact, the largest and most elaborate ones are those built in front of commercial spaces, such as offices, hotels, public parks, and more. 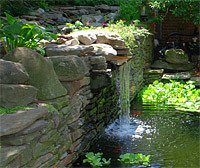 The most common types built in public areas are waterfalls, fountains, and large ponds. Although most commercial types are designed with optimum visual benefits in mind, there are other advantages to them. One is that they are meant to attract customers and let buyers see how valuable that certain public property is. Also, employees who work in an office building, which has a breathtaking water feature, find it easier to achieve relaxation and improved work performance. Our team of designers and builders would like to hear from you. Contact us today for more information and for a free estimate of any water feature project you plan to have in your property.